The networks have always known that we love to get personal, but they are now providing tools to enhance this experience even more. For my first blog for SGM, I wanted to take a look at the updated Discover tab released by Twitter. What is the update all about? The previous Discover tab featured news from around the Twitterverse, acting as a trend front-page where we were all given the same news and stories, whether they were of any interest to us or not. The information you see in the updated Discover tab is now more relevant to you. Twitter have improved their personalisation algorithms to incorporate several new signals including the accounts you follow and whom they follow. 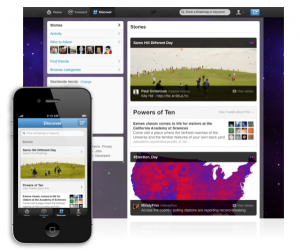 All of this social data is used to understand your interests and display stories that are relevant to you in real-time. As always, there are some people who dislike the update and believe it infringes on privacy. But I think for the majority, the update has made Twitter an even more valuable source of news and information. I am a huge fan – I love that I have to put in very little effort to be provided with news and stories that are of interest to me (although it may be a bit Big Brotheresque!) I think users now expect to be provide with relevant information as standard, no matter the platform. The name of the social media game certainly seems to be custom experience, as all the networks are releasing updates that try to cater for this: Facebook recently released a Trending Articles feature that shows you articles your friends are reading; Google’s search changed completely when it released Google Search Plus Your World, which changes your Google search results and rankings based on your Google+ activity; and now Twitter are providing targeted news stories. This could be an interesting move for Twitter and could help build better relationships amongst Twitter communities. At SGM, we are looking to incorporate this within our social media offering to help our clients develop their customer relationships and become thought leaders in their particular sector.